In the first chapter, the author delves deeply into the disk drive industry of the last few decades. Just as biologists study fruit flies due to their fast pace of reproduction, so does Christensen study the disk drive industry due to the relatively quick pace of innovation (due to Moore's law) that grips the high-tech fields. Through the last several decades, certain disk-drive firms with leading market shares often adopted new and radical technologies that helped them keep their lead. At the same time, other technologies (so-called disruptive) crippled these firms, often thwarting the incumbents into the throes of bankruptcy. What determined whether a technology was crippling or not is one of the subjects of this book. In each case of disruption, there was nothing secret or protected that caused the large firms to fail. On the contrary, disruptive devices were technologically straightforward, packaging known technologies. Despite the simplicity of these devices, why were incumbent firms not the leaders in these technologies? The rest of the book seeks to answer these and other questions. 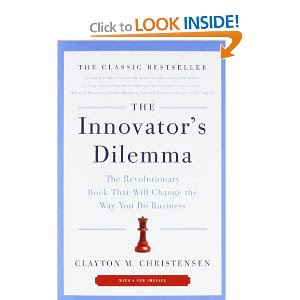 Would be very interested to hear what you have to say about "Innovator's Dilemma". And if you recommend it. Please let us know through your send-outs if you think it was worth the read.